With over 20 years experience catering to the stars all over the world, Sanjay Patel inspires with his culinary masterpieces. With fine cuisine freshly prepared with spectacular presentation, Sanjay Patel knows what celebrities expect in quality. Sanjay Patel has been loyal to the Jackson family as a resident chef throughout the years. 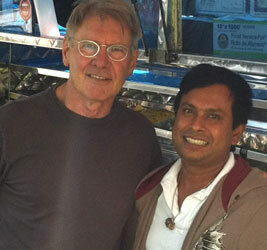 His fine talents have been recognized throughout the entertainment industry in Hollywood and Bollywood.